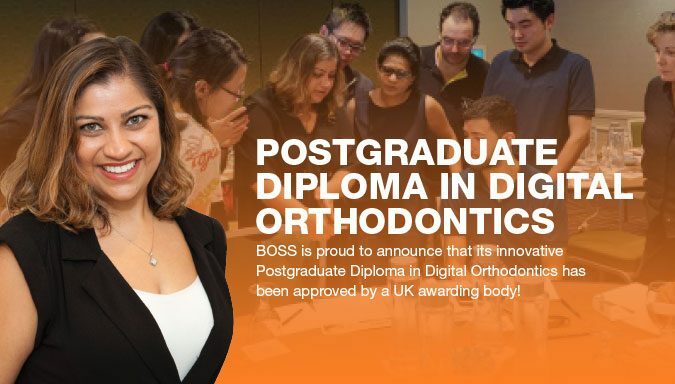 Last week, many months of waiting with eager anticipation came to an end when leading specialist orthodontist Dr Vandana Katyal received the happy news that BOSS’s innovative Postgraduate Diploma in Digital Orthodontics has been approved by the UK awarding body! This was no mean feat, with such honours not being handed out lightly. In fact, the BOSS course is the first 12-month orthodontic course in Australia to achieve this accreditation. The recognition of the high quality of BOSS course content, created by Dr Katyal, further strengthens the credentials of this cutting edge orthodontic education program. And what’s more, Dr Katyal is the first female orthodontist in the world to receive this accreditation for such a course, making it an even greater achievement, on both a personal and professional level. We’ve always known that our BOSS courses deliver true excellence in the field of orthodontic education and that the Australian dental industry is lucky to have professional development of this calibre, so gaining this international approval means a lot to us, and the whole team at BOSS are wearing even bigger smiles than usual this week! So, what’s so good about the course that it’s achieved this global acknowledgement? Comprising 3 face-to-face courses, 12 monthly webinars and 1 in-office program – as well as 2 one-on-one coaching sessions with Dr Katyal – the BOSS Postgraduate Diploma in Digital Orthodontics has been designed to improve confidence, competence and case acceptance with orthodontics. This is not a Specialist Orthodontic degree (which requires 3 years full time study), but it does assist scope of practice and enhance orthodontic skills for dentists. If you take the course (accredited for 104 CPDs) you’ll learn diagnosis and understanding case complexities; treatment planning with digital and traditional methods; and risk management and finishing cases to a high standard. The 12-month delivery provides a comprehensive education in the application of clear aligners and fixed appliances, which can enable you to deliver modern, practical and profitable orthodontics in your practice. And, of course, you can now also receive an internationally recognised certification! If you’re ready to take the next step in your dental career in 2019, click HERE to read all the course details and enrol.